Dating back to the early 13th century, Skipness Castle stands on the east coast of Kintyre and offers fantastic views across Kilbrannan Sound to the Isle of Arran. In the early 1200s, Argyll was ruled by Norway, and it is believed that the builder of Skipness was either Suibhne (Sven) ‘The Red’, founder of Clan MacSween, or his son, Dugald. Their chief residence was at Castle Sween on the western side of Kintyre, and they had another at Lochranza on Arran; these three strongholds gave the MacSweens total control over the Kilbrannan Sound. 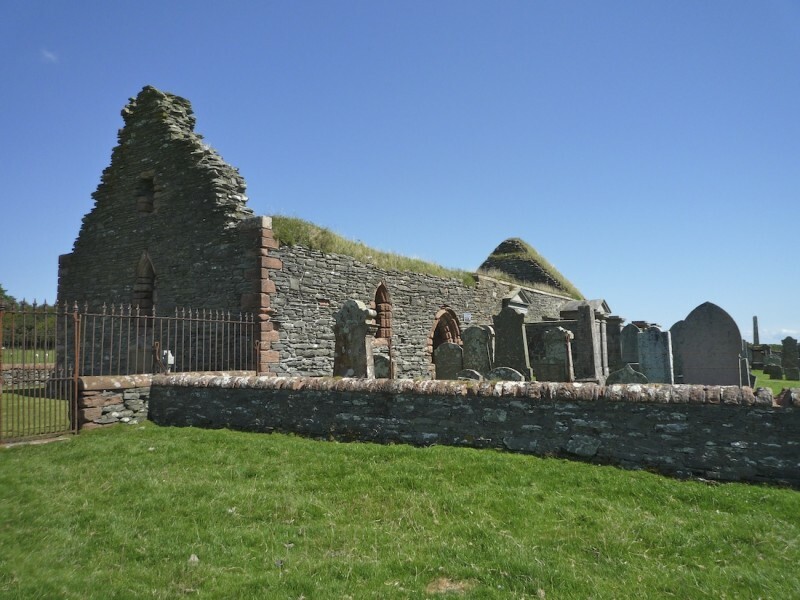 The earliest buildings at Skipness consisted of a two-storey hall-house and a separate chapel, dedicated to St Columba; they were enclosed by a rampart of earth and timber. Unlike many castles, Skipness is not situated high on a hill or headland. Built on a natural raised beach, it is not far above sea level, but it still commands extensive views up and down the Kilbrannan Sound, and it must made a perfect look-out point for the first signs of approaching vessels. It must be remembered that, at that time, any invaders would have arrived by sea. In 1263, King Hakon IV of Norway was defeated by the Scots at the Battle of Largs, and the ownership of the Hebrides returned to Scotland. The MacSweens were subsequently forced out of Knapdale and Kintyre, and Skipness Castle passed to the MacDonald clan, the ‘Lords of the Isles’ whose seat was at Finlaggan on Islay. Scotland was now at war with England, and Skipness Castle was enlarged and strengthened by the erection of a high curtain wall, four foot thick, enclosing the original buildings and a courtyard. Another chapel, this time dedicated to St Brendan (or Brannan), was built a few hundred yards away, closer to the shore, and the now redundant St Columba’s Chapel was incorporated into the MacDonalds’ impressive new residence. Historic Scotland points out that the curtain wall ‘bristles with crosslet-arrowslits and crenellations’, rare features in a Scottish castle, which allowed it to be defended by skilled archers. The MacDonalds became powerful rulers, claiming independence from the Scottish crown; in 1462, John MacDonald II made a secret treaty with Edward IV of England to conquer Scotland with the aid of the Earl of Douglas. However, because of the Wars of the Roses, which led to civil war in England, this plan was never realised. After suffering defeat in 1493 by King James IV of Scotland, the MacDonalds were forced to surrender their lands and power (this is why the present-day Prince of Wales also bears the title ‘Lord of the Isles’). Skipness was seized by the Campbells, Earls of Argyll, and used as a garrison for their troops; the Campbells added the impressive tower house in the north-east corner. During the Wars of the Three Kingdoms in the 17th century, the Campbells sided with the Covenanters, who wanted to see Presbyterianism established as Scotland’s national religion. In 1646, Skipness Castle withstood a siege by forces under the command of Alasdair MacColla, a Scottish Royalist and a member of the MacDonald clan. MacColla was noted for his use of the Scottish claidheamh mor or claymore; he was also credited with devising the formidable ‘Highland charge’, an effective military tactic whereby foot soldiers ran at enemy lines, fired a charge and then fought hand-to-hand. MacColla’s heroic deeds are commemorated in poetry and folk songs. As a castle, Skipness was finally abandoned towards the end of the 17th century. Over the next hundred years, it was converted into a farmstead by the removal of some courtyard buildings, and the erection of lean-to sheds. These were removed in 1898 during early conservation works, and in 1933 the castle was taken into State care. It is now protected by Historic Scotland. When we visited Skipness in August 2010, we were impressed by its size and its enduring sense of power, even though it is in ruins. It’s possible to climb to the roof of the castle, and on a fine day the view across Kilbrannan Sound to Arran is breathtaking. Apparently, Skipness is haunted by a Green Lady, a Highland spirit known as a Ghlaistig uaine; she is said to be a lady of title or mistress of the house, whose aim is to protect her home and family by placing a spell of confusion on would-be attackers. 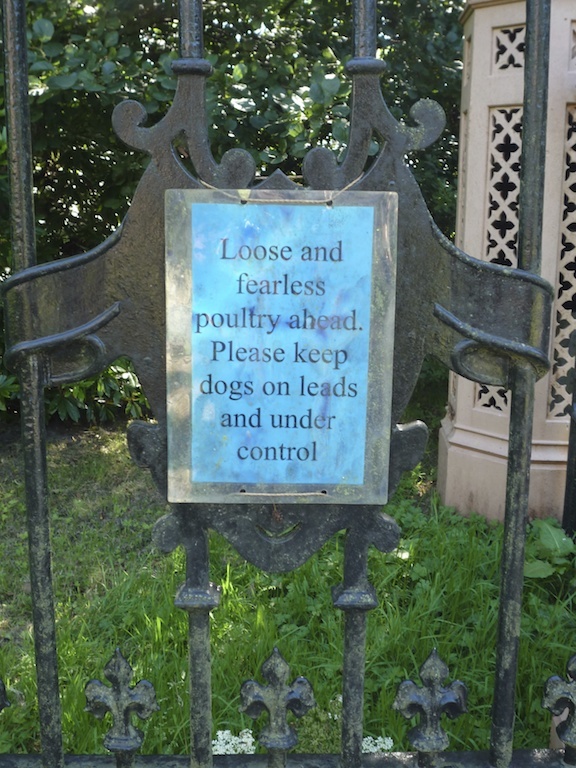 We saw no evidence of the paranormal, but a sign on the gate warned of ‘fearless poultry’ roaming at large in the grounds. It’s likely that even the Green Lady would treat these with respect! This simple, rectangular chapel is dedicated to St Brendan ‘the Navigator’, who, it is believed, was born in the 5th century in County Kerry; like St Columba, he was one of the earliest Christian missionaries to reach the west coast of Scotland. One legend tells how St Brendan and his followers embarked on an epic voyage in a quest for the Isle of the Blessed. Sighting distant land, they set sail and landed on its shore, only to find that it was, in fact, the back of a whale. It’s hard not to imagine the surprise that this discovery must have caused! Canmore, the online database of the Royal Commission on the Ancient and Historical Monuments of Scotland, describes ‘five late medieval recumbent tombstones’ in the surrounding graveyard; but even more interesting are the many vertical grave stones which feature arresting designs such as a skull and crossbones and symbols of farming, weaving and other trades. In some ways, these say more about the person’s love of life and the land than any Biblical inscription. Kilbrannan Chapel remained in use until the 18th century, so it has been a place of worship for nearly 600 years; now roofless, its interior has a lush carpet of grass, and oystercatchers nest on the exposed walls. Like so many ancient, ruined chapels, it retains an air of tranquillity and purity. There is no entry charge to Skipness Castle and Kilbrannan Chapel; both are open all year round. You can park your car in a car park on the left of the B8001, and walk the short distance down a wooded lane to the castle grounds. If you enjoyed this feature, you might also like to read about Castle Sween, just a few miles away on the western coast of Kintyre. Thank you for this interesting article. Both the castle and the chapel were partially restored by Robert Chellas Graham (my maternal great-grandfather) in the late 1890s, under the architectural direction of my grandfather Bertram Vaughan Johnson, who also designed St Brendan’s Church in the village at Skipness. That’s so interesting – so your family was responsible for preserving these wonderful places. Did your family live in Skipness at that time? I don’t remember seeing St Brendan’s church but will be sure to take a look next time we’re over. Thank you very much – lovely to hear from you!